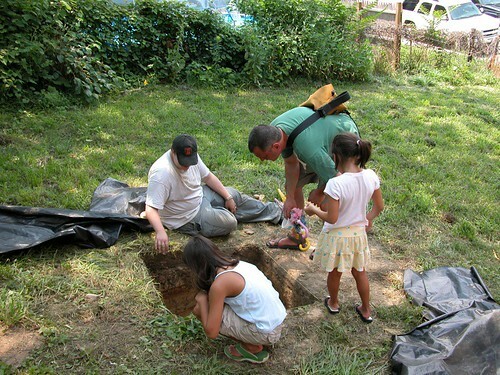 Hampden Heritage: Visitors; upcoming dig day. We continued excavations in front of the hearth today finishing up an artifact rich first strat and moving on to the second. We also completed unit two, exposing an exterior wall of unknown function and recovering a few more nineteenth-century artifacts. If yesterday was a day for new finds, today was a day for site visitors and public outreach. Early in the morning we were pleasantly surprised when Joe Powell dropped by to volunteer. 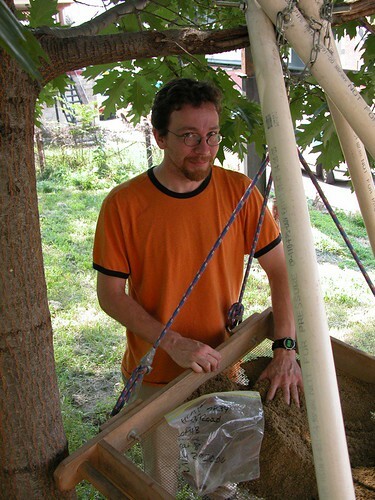 Joe recently moved to Hampden, and has a history degree from University of Maryland. He helped us to screen soil and map until about noon, and plans to come back tomorrow to help out some more. Here's Joe at work at the screen. Later, we got a visit from Maryland State Terrestrial Archaeologist Charlie Hall, who, after a site tour, offered us some good advice and support. A couple of other folks wandered by in the afternoon as well, including Suzannah, Charlotte, and Eric Lipstien, pictured below, who stopped in for a site tour. We invited all of our visitors to come back to our dig day this Saturday. In fact, anybody is welcome to come see what we're up to, screen some dirt, or just take a site tour on Saturday July 29, 2006, from 10:00 A.M. - 2:00 P.M. Our current excavation is at 3839 Falls Road, between Sirkis Hardware and McCabe’s Restaurant, so please stop by.